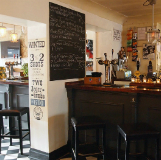 The Thomas Kemp offers a warm and welcoming refuge in the heart of Kemptown. Boasting a delicious food menu, a broad selection of wines, mixtures of local cask conditioned ales, craft beers and a wide variety of whiskeys. Offering stunning views of Brighton and the sea from the front of the pub, a large indoor space and a sun trap garden round the back of the pub, what more could you need. They also have DJ’s every Friday, and a great Tuesday quiz!